One thing I know is, if we’re going to significantly reduce poverty, we’ll have to fight for it. Liberals often discuss antipoverty strategies as if clever ideas could somehow make political mobilization and conflict unnecessary. This evasion of contentious politics takes many forms. Perhaps the most common focuses on correcting public misconceptions and stereotypes. If only we could educate the public, substituting researchers’ facts for stigmatizing myths, then surely public generosity would follow. If we could just get people to see poverty as a structural feature of society, rather than as a matter of individual choice, they would grasp the need for collective solutions. If we could adopt a language of civic inclusion, people would see their identities and interests in more enlightened ways, and there’d be no need for a divisive political fight. Similar hopes underlie the perennial search for new names and frames to deflect attention from stigmatized subgroups of the poor. We are told we should focus on sympathetic groups like hungry children and the working poor who “play by the rules.” Or, if a public program has drawn fire, rename it. Don’t use words like welfare and, above all, don’t talk about race. In my work with advocacy groups, I’m often asked to recommend framing strategies that will “neutralize” the racial distortions that plague poverty debates. Racism is seen as powerful enough to thwart even the most commonsense initiatives. Yet somehow it’s also weak enough that, without an open and collective fight for racial justice, we can banish it with the right combination of words. Harry Potter would be envious of such a powerful incantation. At universities and conferences for experts, a striking number of conversations seem to imply that we would have solved the problem of poverty long ago, if only our policy analyses and program evaluations had been more skillful. A fresh policy design with a smarter incentive structure, a higher level of “cultural competence” among social workers, a more precise estimate of teen pregnancy rates… Amid the endless calls for improvements in what Alice O’Connor calls “poverty knowledge,” hardly a word is said about how to build and harness the power of political organizations or about the importance of ordinary people entering the political arena en masse as demand-making citizens. On this point, the historical record is clear. The lower poverty rates found in European social democracies today are products of labor movements, unions, and parties that mobilized workers to demand more adequate social supports. In the U.S., political conflict and mass mobilization played key roles in both “big bangs” of twentieth-century welfare state development, greatly expanding efforts to reduce poverty in the ‘30s and ‘60s. “Organized political combat,” as Jacob Hacker and Paul Pierson write in Winner-Take-All Politics, has been no less central to recent policy changes that have redistributed wealth to the richest Americans and driven economic inequality skyward. Framing strategies and policy ideas contributed to this redirection of government, to be sure. But how were they advanced, and why did they prevail? The answers can be found in a sustained mobilization of investments and people, in the pressures exerted by interest groups and think tanks, and in the new political forces that transformed and empowered the Republican Party. In the 1970s, sociologists clarified a number of reasons why serious reductions in poverty are unlikely without a political fight. Herbert Gans showed how impoverished groups serve a variety of “positive functions” for other members of society, especially the most powerful and well-heeled. The burdens they shoulder are foundational for the quality of life that middle- and upper-class Americans have come to expect. To the recent horror of Glenn Beck, Frances Fox Piven and Richard Cloward explained why the poor rarely prevail under the normal terms of organized politics, and clarified how concessions can be won when confrontational movements disrupt “politics as usual.” Fred Block told us why the election of even the most liberal government officials is unlikely, in the absence of pressures from below, to shift the state away from policies that benefit powerful market actors at the expense of the poor. Their insights remain just as valid today. History suggests major antipoverty victories can be achieved. But they won’t be achieved by good will and smart ideas alone. They’ll be won politically, when people—in poor communities, in advocacy groups, in government, in the academy, and elsewhere—mobilize to advance antipoverty agendas in ways that make politics as usual untenable. Joe Soss is in the Humphrey School of Public Affairs and the departments of political science and sociology at the University of Minnesota. 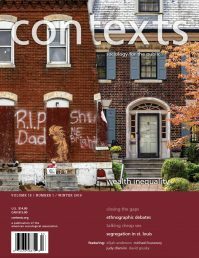 He is the coauthor of Disciplining the Poor: Neoliberal Paternalism and the Persistent Power of Race. I agree that the lack of organized power is a key stumbling block to progressive policy. Still, I think part of it does come down to ideas - not necessarily ideas about poverty but about how government works. A good deal of Americans hold on to the fantasy that widespread popular outrage or popular demand will change policy. It won't. Not without organization. The disorganized masses are no match for an organized elite. While I think a lot of Americans might agree with the above statement, too many bash every organized group as a "special interest" and they heap disdain on "lobbyists". All without any consideration that organized lobbying is the only way to push legislation. So, Americans, with the encouragement of elites, blast Washington Insiders, lobbyists etc. and in doing so not only "choose" disempowerment but recast it as a morally superior position. \"χίλιοι αφρικανοί θα βοηθηθούν από τις πρόσφατες εκδηλώσεις\" ελπίζω να είναι φτωχοί κι όχι πλούσιοι ημέτεροι διεφθαρμένων κρατικών στελεχών που θα αναλάβουν να μοιράσουν τη βοήθεια ...ειρωνευόμαστε τις φιλανθρωπικές εκδηλώσεις των πλουσίων γιατί είναι εκείνοι που καταδικάζουν τους άλλους στη φτώχεια και μετά τους πετάνε ψίχουλα ...τέλος όλοι αυτοί οι σουοερσταρ που τραγουδήσανε και είχανε παγκόσμια κάλυψη και διαφήμιση βάλανε τίποτα από την τσέπη τους ή πάλι ο φτωχός κοσμάκης είναι αυτός που βοηθάει κι αυτοί αυτοί που εξαργυρώνουν το publicity?